If the rumours are true Ferrari wants Kimi, but Leclerc has contract. Why would Leclerc force his contract if Ferrari wants Kimi? Leclerc knows he will get in a Ferrari, why not wait a year instead of forcing a contract.. The main reason i think is because it was promised and was one of the last agreements sergio Marchonne had wanted before he passed. It wouldn'y be fair if they go back on a contract. I read that they want to make him wait another 2 years and thats probably the biggest reason. so much can happen in two years, he could be where sadly vandoorne is and under performing and probably wants to take the jump to ferrari while the opportunity is there. All the rumors today about Leclerc - Ferrari - Kimi, makes the race even harder now to manage it from Ferrari's perspective... I hope everything turns out good. If Charles asks for compensation he will never drive for Ferrari, me thinks. He has to play his cards right and agree with what the team has planned for him without fuss, just stick to driving the car. He hasnt been that impressive lately, he has less than half the points Gasly has, in what many consider, an inferior car. Ericsson is closing in on him on pace, considering how everybody beat ericsson as teammate, this raises some questions. That culminating with him being knocked out in Q1 here, while Stroll managed Q3 in a williams. Maybe all these rumors are getting to Charles as he is a young blood and only in his first year. Kimi isn't at Seb's level during a whole season, but who is? Last edited by IulianFerrari; 2nd September 2018 at 11:53. If Charles asks for compensation he will never drive for Ferrari, me thinks. He has to play his cards right and agree with what the team has planned for him without fuss, just stick to driving the car. He hasnt been that impressive lately, he has less than half the points Gasly has, in what many consider, an inferior car. Ericsson is closing in on him on pace, considering how everybody beat ericsson as teammate, this raises some questions. That culmination with him being knicked out in Q1 here. +1......he needs more time...2020 sounds about right. Brazilian F1 journalist posted today the Leclerc is Ferrari driver for 2019. Official annauncement will take place sometime after this weekend. Probably next week. Well, if a Brazilian F1 journalist posts such information about Ferrari contracts then it must be true. 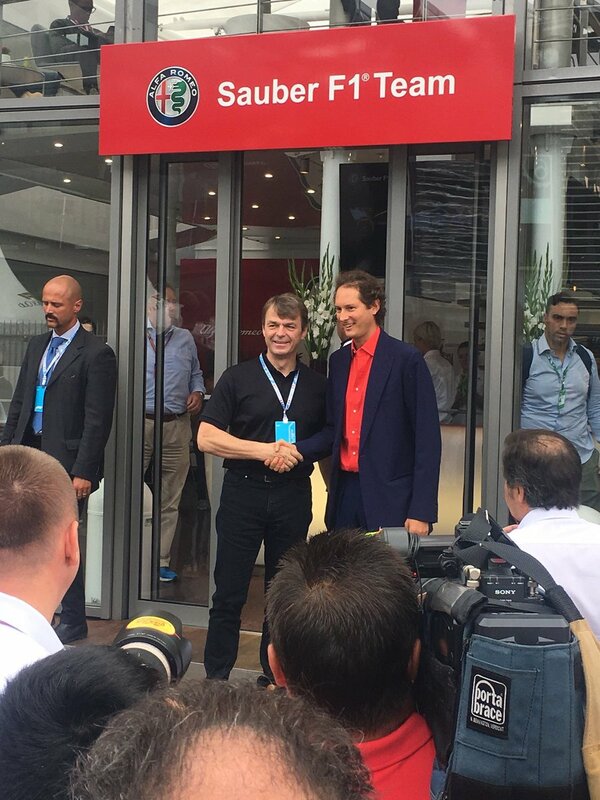 I have a feeling that, this may not be the usual Kimi replacement rumor. Feels like too many smokes now to not have a fire somewhere. Only thing that tips me off is Ferrari not announcing Kimi right here, at Monza. If it was decided for Raikkonen to stay, it would have been announced here. Ferrari should not "raise" drivers, they have other teams for that. We should only get "cooked" drivers, so if Kimi is to be replaced, the decision to sign Leclerc and not Ricciardo is not a good one in my opinion. as this point I'm wondering if Kimi and Charles would be the better line up. If Charles is the future of Ferrari yes. If Vettel can't manage Kimi being sometimes faster how would he do with a youngster? Kimi is snail in race pace. Seb is hotheaded, but he is very fast, especially on race pace. With half of car missing today he was 7s behind Kimi after spinning in first lap doing one PS more. If Leclerc is faster then great, but its clear Kimi isnt. Guy cant win to save his life. Funny how so people here are talking how charles is faster than kimi and how seb will be frustrated he can't beat him. Based on what? Him beating Ericsson? So did everybody he had as teammates and they are no longer in F1. It seems to me like people here think, any driver on the grid is better than what we have. But as a snail as Kimi is, he raced Hamilton, beat him to pole lost because of blistering and blew away Bottas all weekend. I'm sure that most of the drivers on the grid can do that. As for Seb, people forget how many wins he brought us and where we were when he joined and where we are now. Seb would take Leclerc to the cleaners at this point in their careers. How many times has Vettel screwed up when it mattered most though? I'm of the view that Ferrari should not only sign Leclerc as a Kimi replacement but primarily to replace Vettel in the near future who can't be counted on to close out a championship. You think Leclerc can be counted on to close out championships ? That remains to be seen. The underlying problem is that Vettel didn't make the most of last season and certainly isn't this season. If he isn't going to win a title against Hamilton, then why not roll the dice? Ferrari need Leclerc to make the impact Hamilton did when he entered F1. I agree with this actually, but difference with Seb and Kimi is that Sebs race pace is devastating fast, and Kimi is nowhere more offten then not. That is why he hasnt won for 5 years now and cant get close to closing a race with a win while leading, let alone championship. Seb is fighting for championship with all his stupidity, Kimi is still 60pts of while driving "best" he has in his Ferrari years. Leclerc can barely beat Ericsson at this point. Like I said here many times, Gasly has more than double the points in an inferior car and you think Charles can beat Louise? That's a laughable supposition. If we decided Kimi should not stay we should have gotten Ricciardo. Amm most of pts Gasly gained was at beginning (bahrain) where STR was much better then Sauber. Leclerc is driving great, so if RB is giving chance to Gasly, why wouldn't we give to Leclerc? Kimi is absolutely out of the gate. Seb should have been as well. If it was up to Marchionne, I think both would be gone after yesterday. Alonso for Vettel, Leclerc in for Kimi. Design team gave them everything and operationally, team ruined entire championship. Vettel with his mistakes, Kimi with him not having any pace on Sunday and team for being boneheaded beyond belief (while Merc does everything right). Like all top teams(including Renault), I am done with Fernando. No thank you. How is Leclerc driving great, explain it to me please, he's 15th in the WDC and getting knocked out in Q1. Is that what you want at Ferrari ? How is Kimi "absolutely out of the gate", by grabbing pole and finishing 2nd, being 3rd in the WDC? We can't just make a change for the sake of making a change. If it was Ricciardo than so be it, but Leclerc is not where we need him to be yet. Last edited by IulianFerrari; 3rd September 2018 at 09:12.